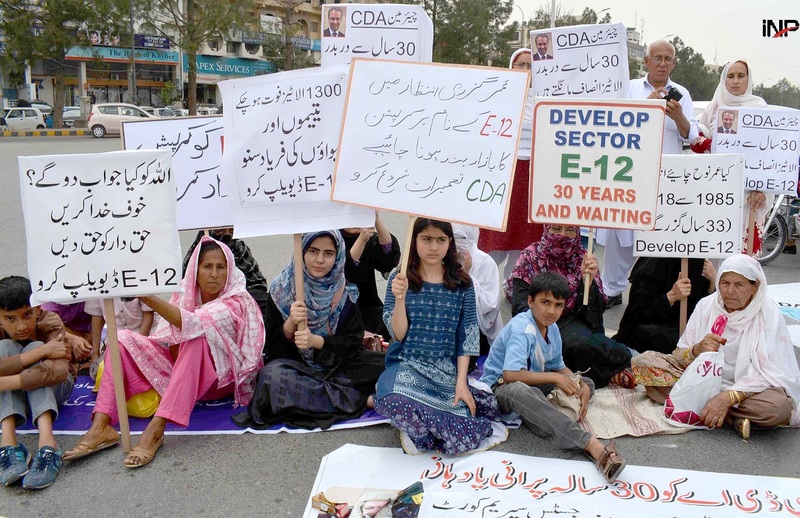 ISLAMABAD: Hundreds of allottees of Sector E-12, who have been denied possession of their plots for the past 30 years, staged a protest at D-Chowk here on Tuesday to highlight their plight. The allottees gathered at D-Chowk at around 11 am and staged a sit-in, following which the police cordoned off the area and diverted the traffic to service road while officers of district administration tried to negotiate with the protestors to clear the road. MNA Asad Umer of Pakistan Tehreek-e-Insaf (PTI) and Mian Aslam of Jamaat-e-Islami (JI) also accompanied the protesters. Allotted back in 1989 to both in service and retired government servants, a total of 4,430 plots remain in limbo. As many as 1,300 original allottees have died during the past three decades awaiting possession. 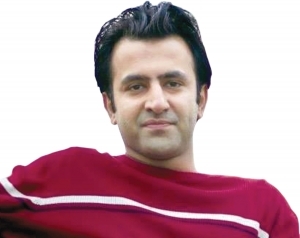 Capital Development Authority Member Estate Khushal Khan reached the occasion and while addressing the protestors, he said that CDA was acutely aware of the problems and has held multiple meetings to hammer out a solution. “We’ve drafted a bill and will present it before the parliamentary committee on March 29. The allottees are welcome to form a committee and we’ll hold talks with these representatives and ensure that a way out is agreed upon,” he added. Asad Umer, MNA from NA-48 where Sector E-12 is located, assured the protestors that he and his party were with them in their hour of need and will do their utmost to resolve the decades’ old issue. “The development of E-12 should be completed at earliest and all the parties involved must sit, deliberate and resolve the issue,” he added. While talking to Pakistan Today, Rana Owais, an allottee, said that despite the orders of the Supreme Court (SC), they have been denied possession. “1,300 original allottees have died since 1988 and their legal heirs are made to run from pillar to post in vain. It is about time that CDA wakes up from its slumber and resolves the issue,” he said. It is pertinent to mention here that not a single leader of ruling Pakistan Muslim League-Nawaz (PML-N) was present during the protest. On the other hand, Senate Standing Committee on Cabinet Secretariat Tuesday observed that CDA remained unable to compensate the affected people of nurseries and land in Sector E-12. According to a statement issued here, the committee meeting was held here at Parliament House under the chairmanship of Rasheed Ahmed Khan. Among others, it was attended by MNAs Asad Umar, Malik Ibrar Ahmed, Sardar Muhammad Irfan Dogar, Parveen Masood Bhatti, Shahnaz Saleem, Nighat Parveen Mir, Rasheed Ahmed Khan, Nafeesa Inayatullah Khan Khattak, Moulvi Agha Muhammad, Shaista Pervaiz, and secretaries of Establishment Division, Cabinet Division and senior officers of the ministries and departments concerned. The Senate body constituted a four-member sub-committee headed by MNA Rasheed Ahmed Khan to monitor the implementation status of its recommendations so that longstanding issues of CDA could be resolved without a further delay. The committee endorsed all the budgetary proposals of Capital Administration & Development Division (CADD) and its attached departments relating to the Public Sector Development Programme (PSDP) for the financial year 2018-19. Develop E-12. 30 Waiting. Now it’s time for CDA to comes out from land mafia system. This is worst thing for CDA that they did not develop the Sector E-12 since 30 years. Out 4,430 Allotees, 1,300 Allotees died in waiting. But CDA officers are doing nothing although they took money from Allotees 30 years ago. CDA has miserably failed to secure possession of Sector E-12 land which was acquired in 1985 by CDA. E-12 twin-sector D-12 and subsequently launched sectors I-14, I-16, G-13 and G-14 have since been developed. Total numbers of plot allottees in E-12 Sector are 4,430 of which most have passed away without fulfilling their dream to built own houses in E-12. The allottees spent their hard earned money on plots and they had to spend further millions of rupees on rent of hired houses in the last 30 years. Keeping in view past 30 year experience, there seems little hope that CDA will ever develop E-12 Sector. I, therefore, humbly request to the Chief Justice of Pakistan to kindly look into the matter on humanitarian grounds and direct CDA to complete development Sector E-12 at top priority. You are our only hope to fulfil our dreams of having own homes, coming true after 30 years since allotment of plots in E-12 Sector. Higher Authority kindly take up the matter of I-15 it was also low cost scheme but still un developed.Allotment was 2004_05..